The perfect companion for the VYPYR Pro, Peavey’s updated Sanpera Pro Footcontroller unlocks all the power of the VYPYR Pro. Utilizing dual expression pedals which can be assigned to the default setting (volume on left, wah on right), or to any other stomp or effects parameter, the Sanpera Pro footcontroller is also range definable! 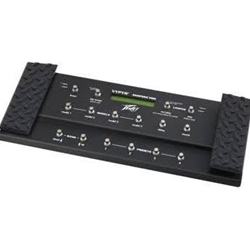 The footcontroller also features a boost switch, tap tempo, a chromatic tuner, and looper controls that allow users to generate multi-track loops. Peavey Sanpera Pro Foot Controller Features Two expression pedals offer real time control over Volume, Wah, Pitch Shifter, Rotary Speaker and Slicer 10 momentary selector buttons with LEDs Swappable expression pedals Dedicated tap tempo capabilities Looper control Bank increment/decrement function Roadworthy cast-metal housing High-quality metal switches Self-power via MIDI Large LCD display Preset select or instant on/off effects operation Access almost any Vypyr amp function On-screen tuner.